Why do business with Huron Tractor? Huron Tractor is one of John Deere’s largest partners in Canada, with nine locations servicing southern Ontarian's, but our story started with one man, over half a century ago. Our approach to business has always put the customer first. We’re proud to serve a community of customers that spans agricultural operations, commercial enterprises and homeowners, with one of the largest inventories of machines and parts in Canada. Huron Tractor continues to proudly serve thousands of Ontarians through its nine dealerships, providing new and used machines, technology solutions, parts and service to agricultural, commercial and residential markets. 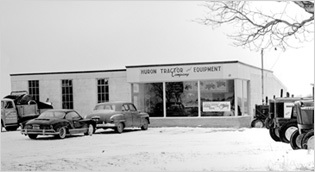 Although times have certainly changed since 1961, Huron Tractor’s strong commitment to its customers and employees remain sincere. Huron Tractor Stayner opens the doors to its newly constructed 26,000 sq. ft. facility to accommodate the steady growth and better serve customers. The Partnership group of Barton, Studnicka, Fulton, Cormier and Sheeler acquire the remaining common shares of Huron Tractor as the former ownership group of Hakvoort, Rudderham, F. Winters, H. Winters and Van Oss complete their succession plan. Brad Sheeler joins the Huron Tractor Ownership team after working as a Chartered Professional Accountant in public practice. Chris Hare joins the partnership group after joining the Huron Tractor team in 2009. Leon Cormier joins the Huron Tractor Ownership team after spending 16 years with a forestry and construction equipment dealership. Huron Tractor Exeter opens the doors to its newly constructed 68,000 sq. ft. facility, adjacent to the existing dealership. This new facility more than doubles parts and service capacity to service the needs of the growing customer base. Dave Fulton joins the Huron Tractor Ownership team after 20 years as a PFW employee and partner. Succession begins as Cam Barton & Nick Studnicka join the Huron Tractor Ownership team following 10 year careers at John Deere Canada. Huron Tractor and Northridge Tractor, of Walkerton and Chatsworth, merge operations. Huron Tractor acquires Dave Rawn Equipment in Stayner. New partners Scott Gilmore, Todd Wilkie and Jeff Eby join the team. An all-new Huron Tractor retail environment is launched in north London. Designed to John Deere retail specifications, the store provides improved support to Residential, Commercial and Agricultural customers, in addition to the growing number of large property owners. Shares of Logan Equipment in Mitchell are acquired. Brian McGregor joins the partnership team. The Arva store is opened as a satellite Lawn and Grounds Care dealership. Over the next two years, the new partnership is formed in Exeter, Ontario. Frank and Henry Winters, Paul Vanoss, Peter Hakvoort and John Rudderham will point the company towards further growth, as Thamesford and then St. Thomas are acquired in 1993 and ’99 respectively – the latter bring a new partner in Darryl Speers. The start of a new era. Jack and the partners begin the search for a new team, as thoughts of retirement enter the frame. A new decade is greeted with new opportunity. Jack and the team need a place where machinery could be stored and marketed through the long, cold winters. The Trade Barn was established. By mid-decade, Huron Tractor brings automation to the dealerships, introducing sophisticated business management software and becoming the first equipment dealer in North America to use the PFW business system. Huron Tractor blossomed. The hard work pays off, and new hands are needed to feed the expanding business. Herb Verbeek, Bruce Hasselback and Earl Long join the team, as stores in Blyth and Walkerton are opened. As the business grows Jack persuades Harry Winters to join as a partner. Jack Van Bussel, with his family, opens the first Huron Tractor facility, which doubles as an automobile service station.